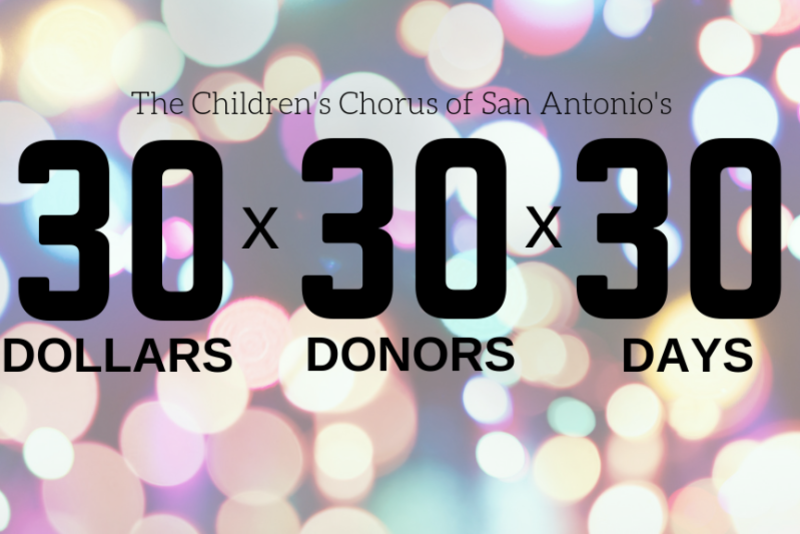 We each have a goal: 30 days, 30 donors, $30 each. Singing in choirs is the most active form of music making in our country. It crosses boundaries and builds social capital, engages the mind in fantastic ways, and is accessible to almost all humans regardless of physical ability. And each of us already possesses this most natural of musical instruments: our voice. students in underserved neighborhoods on the East, South and West sides of San Antonio with tuition-free programming that parallels our training ensemble curriculum in every aspect. Kids in music programs outperform their peers on math and english standardized tests. In school, students participating in music have better attendance, fewer discipline referrals, and are more likely to graduate than non-participating students. Singing in a choir develops and maintains strengths and supports beyond music skills that empower our singers to thrive in life including positive values, social competencies, and a strong commitment to learning. And, the longer they are involved, the greater the impact! We have a new video available and have included in on our story page for the campaign. Please feel free to reference it in your message to supporters and friends. It's a great message about CCSA from our singers! Day 10 - 34% of goal achieved! We're so excited - in just over a week, we have raised one-third of our overall match from the Kronkosky Foundation! Thank YOU for your enthusiasm and support! Day 5 - 11% of overall goal achieved! Hi, Fundraising Champions and Supporters! We're off to a great start with 11% of our overall goal achieved as we write this update. Here's a graphic you can share on your FB page or Twitter feed. We want you to feel a part of the CCSA family! 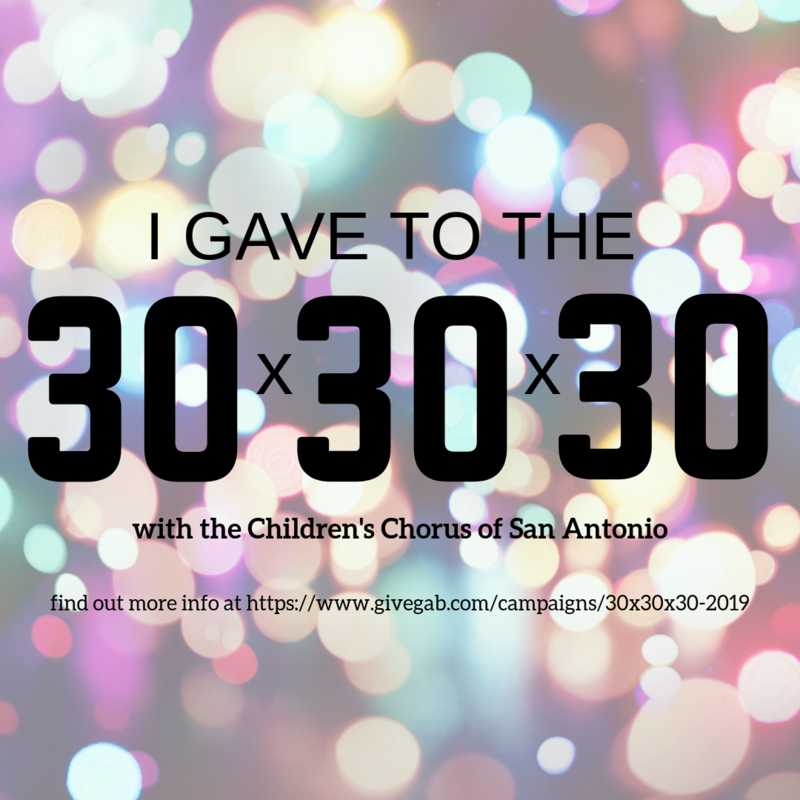 The Children’s Chorus of San Antonio is dedicated to enriching and expanding the experiences of young people through choral singing and musical performance. Under the direction of Artistic Director, Dr. Ryan Garrison, CCSA’s commitment to artistic excellence, social inclusion, and individual responsibility empowers young singers to embrace and explore a broader, more positive view of self and the world.